I don’t read series books back-to-back, not normally anyway. I usually take my time and read about one every 6 months or so unless I’m caught up and then I just wait for the new one – but look what I did! And on top of that I have 3 (count them) books to be read before the 1st – for reading groups. Too bad, I guess – I’m housecleaning big-time and need my background. 🙂 – And I won’t finish all 3. 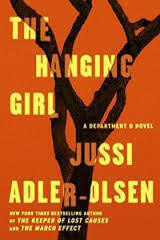 Besides all that – I’m hooked on the continuing characters of the Dept Q novels, Carl Mørck the detective in charge of Cold Case Files in Copenhagen’s police department, Assad, his assistant who is apparently exceptional at everything except revealing anything personal, and Rose, a young strange, goth-type woman who is supposed to be a receptionist but has managed to include herself in the case resolutions. As of The Marco Effect there is one more character – Gordon – an administrator Mørck takes joy in over-riding. So the reader gets the usual Prologue which depicts a girl being struck by a car and landing in a tree. The scene then switches to Chapter 1 and Dept Q where Carl gets a phone call from a retiring police officer in remote part of Denmark – the next thing we know the officer has shot himself in the head at his retirement party. Meanwhile Carl’s cousin Ronnie, who has said very bad things about Carl, has died and Ronnie’s brother has gone to take over. Plot threads weave from there. Adler-Olsen’s plots have become a bit formulaic but I still love the Dept. Q characters so I’ll likely grab the next volume as soon as it’s available – not soon.